Mosses are tiny organisms with slow temporalities of growth which can decipher the secrets of life on Earth. They pioneer the land when glaciers step back, preparing the land to be refilled by a rich biodiversity. They welcome life in a modest exchange of moisture and some sunlight. Because of its reduced size and simplicity they can resist in harsh conditions constraining their rate of growth and becoming one of the most efficient organism on this planet. In times of drought, the enter a suspended animation state (anabiosis) surviving for years waiting for the water to come back. Some species can also survive on polar caps; growing moss remained alive while frozen for 40,000 years in the permafrost of the Kolyma Lowlands of northeastern Siberia together with fossil diatoms, bacteria, cyanobacteria, yeast, fungi, actinomycetes and other microbial life-forms that are proved to resist in the outer space0. They can also tell us stories about our alienated nature and help us how to create connections with our planet. Understanding moss we could also decipher Life's Future on a damaged Earth and beyond. PLEASE, ENJOY THE VIDEO BELOW. Muskaria: Mossphone, Beyond IohT in the Artic Circle from Vlorenzo on Vimeo. 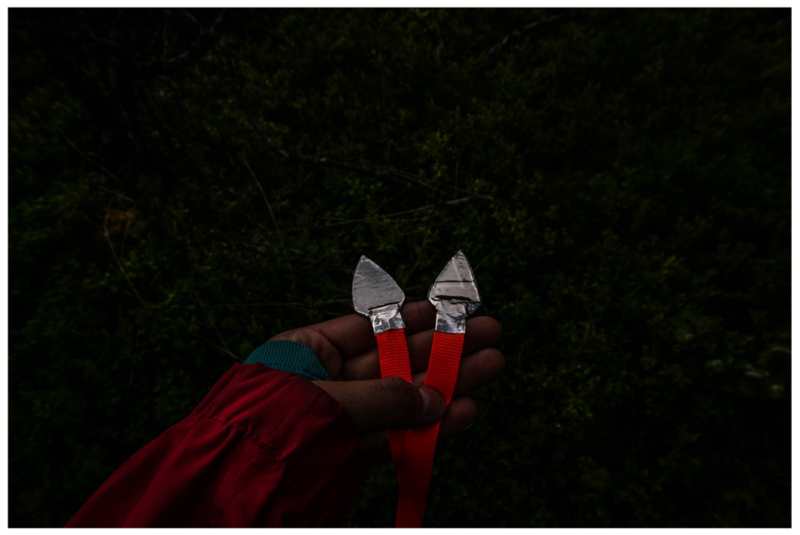 In the beginning of the summer I headed towards the Kilpisjärvi Biological Station (69°03'N; 20°50'E) located in the north-westernmost part of Finland, an extremity of Finnish Lapland, between Sweden and Norway. The Station is located at the base of the holy Saana mountain, which is embraced by a vast tundra and a glassy lake from which emerges the also legendary Malla. The breeze coming all the way from the Norwegian Shore of the Arctic Ocean contain the salty particles that reach Malla and contribute to the existence of Finland’s foremost plant rarities1. Notes from the field: According to locals, the legend claims that long ago, a love union between giants Malla and Saana would have been held by the seer Paras (a fell on the Norwegian side). Unfortunately, the wedding was crushed by Pältsä (a fell on the Swedish side) who was also in love with Malla. The jealous giant had convinced the elderly women of Lapland to come to Kilpisjarvi to invoke the fierce of the northern wind which wiped all the invitees with ice-cold wind. At the last moment, Sanna rushed Malla into her mother’s arms, Big Malla. The helpless Malla cried forming the lake Kilpisjarvi. Millenia later, when the ice melted and giants emerged, Malla gave birth to her daughter Kitsi, the waterfall coming out from the rocks facing Pältsä. In the summer, when the water from the snow runs free on the fells under the mossy couch over a limestone bedrock, she expels her most powerful drops down the rocks. Across the path, the surface drowns a few centimeters to ensure moisture for the rest of the summer. Bathed by the lake and located at the feet of Saana, our residency Kiekula is submerged in a birch forest densed with moss, stones and reinders. This mesmerizing area is packed with stately erect granite boulders to be seen along the base of the fell. Some of this venerated rocks are believed to be earth spirits, Lapps who went to live underground. Behind the house, cargo trucks transport goods along the Scandinavian borders through the «War road». This road was built by Russian prisoners of war during the WWI and strategically used during the WWII. Locals whisper that a conglomerate of mud, rocks and bones might be lying beneath the road. “Sometimes is hard to distinguish fact from fancy” claims a local guide for the “modern tourist”. At this point behind Kiekula, the road is watched closely by earth spirits: two magnificent rocks covered by a sublime layer of moss, both silent witness of the horror stories that might have took place in here. Another kind of skin formed millions of years before, when the atmosphere became breathable and mosses emerged from the oceans to conquer the land. Bacteria started to break down the stone releasing minerals and forming the soil where the windblown spores of moss had landed. The moss turf trapped decaying organic matter that accumulated at the base of the moss where it built up more soil5. 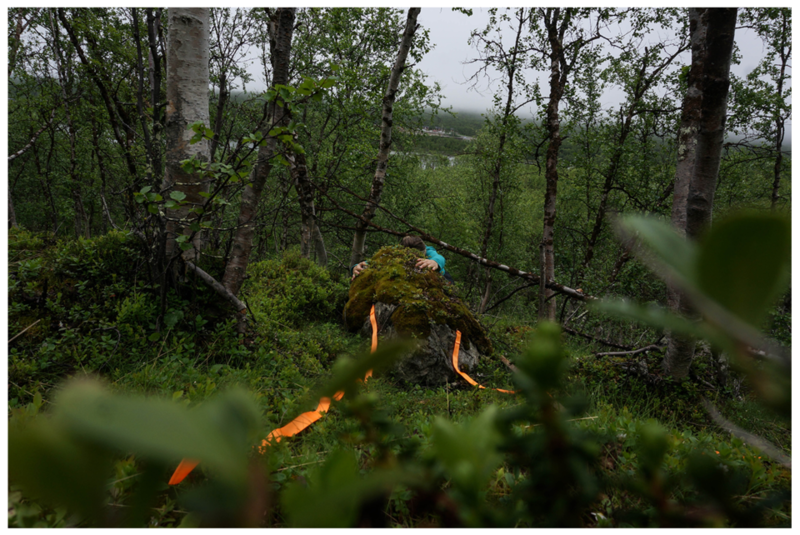 This organic couch served fungi to sew the filament network that will help proving an anchor to the ground; a conglomerate of moss, lichens, fungi and other microbial life-forms. This green mossy carpet wrapped the Earth and became part of its sensing organs, able to feel environmental features from the Glacial Age to our present6. They act as a nexus between worlds: grounded on wise old rocks, inhabiting water streams and fed by the wind, who carries their food and lifts their spores on the top of skyscrapers or Uralite rooftops. Mosses lack a root system and rely on deposition from the atmosphere trapping pollutants, both particulate and gaseous. Since the late 1960s, they have been used as bio-monitors of atmospheric deposition of heavy metals in the Nordic Countries. For example, the European Moss Survey7 has been monitoring heavy metal deposition from the atmosphere since 1990. Back in the 1990s, in Kola Peninsula in Lapland, lichen and moss were proven to be the key agents to be considered as material witness of the damaged ecosystem. through them, the lack of nutrients, air pollution were monitored to determine toxic particles combined with a LANDSAT 5 TM satellite to map pollutants after an ecological threaten8. Since 2008, the MOSSclone project, monitor air quality by controlling nitrogen, sulphur oxides and heavy metals like cadmium, lead and nickel using cloned and native mosses in urban areas9. "Therefore we are trying to conceive a new way of thinking about computers in the world, one that takes into account the natural human environment and allows the computers themselves to vanish into the background." The computer of the 21st century, Mark Weiser. The use of moss as sensors flashes the idea of a blended Internet of hybrid Things (IohT)10 or even more, a sort of Ubiquitous Multiespecies Computing (UmC)11 where the computers are not only forced to live out there in the world with people (human and non-human) but also be made partly or completely out of there in the world with people12. But this concept might simplify the complex interrelationships of the living and our fabricated reality plants, fungi, bacteria, networks and signals) by considering them just as part of a global data processing network and not as an assemblage of life, sensing technologies and our capacity of making sense out of things. However, if we think about moss as an active agent (or even as a witness) in the planetary event of global warming we also challenge the notion of mosses as citizens with memory, sensing capabilities and political weight 13. Suddenly we realize of the power of moss materiality in the context of an ecological crisis. More, they can affect how we perform policies and create forms of collaborative sensing technologies. When we track a nonhuman or an animal, we are not tracking directly the climate change but how do they sense it, how it affects them. Suddenly we are not in the center anymore. Nevertheless, when we put a technological objet on birds, seals or trees, we still have an anthropomorphic approach that keeps privileging human existence (subjects) over the nonhuman (objects). Instead of establishing a common ground to enable equity by considering the nonhuman at the same level. When we first touch moss, we experience a pleasant feeling of joy. Dipping our fingers into this humid pool of life, we enter part of our existence into an age-old queendom of resistance. Our body interacts physical and emotionally with a microcosm inhabited by millions of critters that unintentionally and irremediably keep track of humans influence in the Earth processes. How to enable an intimate dialogue with them? How to plug into it ? Are non-human organisms and its networks able to streaming out “new” versions of the real ? How do they perceive it? Would this “new real” help us to project our existence (humankind, elseotherkinds) beyond the Anthropocene? 2 The last bullets of the Finnish war were shot in this area of Lappland, around our residency. Finland at War: The Continuation and Lapland Wars 1941–45, von Vesa Nenye,Peter Munter,Toni Wirtanen,Chris Birks. 4 Equally, Jenniffer Gabrys quotes this extract from Business week that triggers in me a sort of disagreement because of the simplification of how things migth work, perfectly entangled in its complexity beyond our understanding. A much more sophisticated skin was already formed before the addition of electronics in order to grasp what is going on. "Planet will don an electronic skin", Bussiness Week 1999. 5 Moss inhabits nearly every ecosystem, growing in places as diverse and harsh as sterile rocks, the crack of a branch in a desert or inside the darkest caves. Robin W. explains the hard work done by mosses in exchange of mist and a pinch of sunlight. They build up soil, collaborate with fungi, bacteria and lichens to make the place livable and attract more life. Gathering Moss: The Natural and Cultural History of Mosses, Robin Wall Kimmerer, 2003. 8 "Kola Peninsula pollutants and forest ecosystems in Lapland: Final report of the Lapland Forest Damage Project" Finland's Ministry of Agriculture and Forestry, Finnish Forest Research Institute – 1995. 14 Jane Bennet claims that political theory needs to do a better job of recognizing the active participation of nonhuman forces in events. Only when humans realize the “vital materiality” that runs through bodies, we could get a more decent politics, less devoted to blaming individuals than to potting the light on the web of forces affecting situations and events. "Vibrant Matter", Jane Bennett, 2016.